The fact that so large a number of camps appears to be totally lacking in any water supply has provoked much obvious comment and a great deal of less obvious theorising. In the case of the hill-systems of the rest of England the difficulty frequently disappears, for as anyone knows who has walked across them, the highest levels of the moors and bills of the northern and western counties never lack abundant springs, and when the climate was wetter than now it is the springs likewise must, have run more copiously. It may safely be said that the occupants of no camp in Northumbria, Wales, Exmoor, Dartmoor, or Cornwall had far to go for water, and in very many instances springs rise actually within the camp, or even flow across it.1 But in southern England, that is to say, on the chalk hills, the case is otherwise. Here the springs are at the present day remarkably few. Such springs as there are lie at the foot-hills, and, save for artificial reservoirs, the upper levels of the Downs in Wilts, Dorset, and Sussex are almost entirely waterless. Pitt-Rivers made a special point of discovering, if possible, from what source the occupants of the camps which he examined could have obtained water, but with very little success. In regard to the camps of Sussex, he declares2 that he had " not met with a single example of a fort having a supply of water within the enclosure, and the majority, like Cissbury, are at a considerable distance from any spring." Half a dozen theories, more or less probable have been mooted in explanation of the difficulty. It has been suggested for example, that the springs of the Downs once flowed at levels far higher than at present. Pitt-Rivers in the case of Winklebury that a spring near the camp only runs in wet seasons ; and he gives the authority of a local well-digger for the assertion that a spate in the Adur affects the level of water in wells several hundred feet higher up on the Sussex Downs.5 Both these facts tend to support the theory, but against it is to be set the fact that there are few indications upon the Downs of old water-courses, although in the chalk soil even a small stream must have speedily cut a very noticeable channel. Another suggestion is that the camp-builders took their supply from wells, and. any pit within the area has been supposed to be the mouth of such a well. But excavation has in many cases shown that such pits are not wells, and although it has further proved that even the earlier occupants of, e.g., Cissbury could and did sink mine-shafts upwards of a hundred feet in depth, there is no reason to believe that they ever attempted shafts of the depth necessary to reach water at these elevations - to a depth, that is, of some 300 feet.6 Yet a third set of theorists, compelled to admit there was no evidence of any supply within the camp, have, seen in the various deeply-worn trackways leading therefrom so many covered ways " intentionally constructed to secure access to some spring more or less remote. Thus, at Cissbury, it has been alleged that such a " covered way " was constructed the whole distance to Aplesham, fully 3 miles ; and even Pitt-Rivers was forced to conclude that the supply was brought from Broadwater, 1½ miles away, the well at Leechpool, 1 mile, to the east, being thought to be of later (Roman) construction. Other theorists, giving the problem up, have simply maintained that such camps were never intended for occupation save on the occasion of a sudden raid-that they were merely camps of refuge. But admitting that this may be true of some, it is certainly not true of all. Cissbury itself is supposed to have had a permanent population of flint-knappers, possibly even before the great ramparts were thrown up ; so the theorists are reduced to the supposition that this population must have come to work in the morning and gone home else whither in the evening, carrying with it a sufficient supply of fluid for the day's requirements, precisely as do the navvies of to-day. It may be added that Pitt-Rivers, having discovered upon one site in Wilts the skeletons of persons who had apparently suffered acutely from rheumatoid arthritis, suggested that these victims of the disease had contracted it through long fetching and carrying of water to their camp! Anyone who knows bow damp is the atmosphere of a high hill-top will doubt whether it is needful to seek so far for the explanation. The theory that the camps depended upon ponds now dried up, a theory several times mooted only to be dropped again, has lately been revived by various speculators,7 who believe the so-called dewponds still found upon the Downs to be merely a survival of the actual means of supply in use among Neolithic men ; and still further, they assert that Neolithic man built his ponds according to the same elaborate method now practised by the pond-makers of Wilts and elsewhere. They cite two or three instances of camps in or near which such ponds are found, pointing out that the ponds may in some cases conceivably have some structural connection with the camp, and that in other cases there are trackways leading from, the camp to the pond. Upon this evidence - mainly drawn from existing facts at Cissbury, Chanctonbury, Maiden Castle, and Figsbury Ring - has been based a theory which is held to solve the problem of a century, and to cover all and every camp to which the problem applies. What is the value of the evidence will appear later. Ponds on the high chalk-down are of two kinds; some are artificial and others are natural, but both kinds are fed almost entirely by dew, fog, and mist.8 With natural dewponds man has no concern; they are mere waterholes, large or small, scattered about the uplands, sometimes in the open, sometimes amongst dense woods, but invariably affording a supply of water even in the hottest months of the hottest summer. They are only to be found where there occur pockets of more or less clayey soil overlying the chalk, for the latter in its natural state is usually too porous to retain water. Such deposits of clay, of varying extent, are common upon the Downs; clay mixed with sand or gravel forms the surface-soil over large areas, and it occurs occasionally as a capping to the highest summits, but more commonly in. pockets at somewhat lower levels. At Walton-on-the-Hill, Surrey, is an immense pond, appropriately known as the Mere. Modern wells require to be sunk 300 feet or so to find water hereabouts, and the village-an ancient one, once boasting itself a royal manor, and still retaining what would seem to have served it as a moot-hill --- must have come here because of the pond, which, according to local tradition, has never been known to fail. But mostly such ponds are small, and commonly very small. A totally different thing is the artificial dewpond. A shallow, saucer-like depression, usually of severely regular plan - circular most commonly, but occasionally approaching a squarer form - its artificial origin is betrayed no less by the raised embankment surrounding part or all of its periphery. No trees overhang it, not the smallest shrub, arid not a furrow marks the smooth green turf about it. So smooth is the sod, so gently and with such slight relief does the embankment swell and fall, that the whole work is invisible at the distance of a few yards. You come upon it unexpectedly, and at first sight of its vallum there flashes into your mind the thought that here is a barrow --- the rare disc-barrow, belike ; until climbing the low bank you find yourself looking down upon an unsuspected patch of water, motionless, untenanted, naked to the glare of the, sun here on the very roof of the world when the surrounding Downs are baked hard by the heat, and there is never a spring or a well to be found perhaps within miles. When seen from some vantage-point a little further off, the effect is odd in the extreme - a succession of concentric rings of different hues laid there upon the open Down as if painted by man's hand. The monotonous dull green of the turf comes sharply to an mid, as if ruled by a compass, and next to it is the bare white floor of the basin ; for the heat of summer shrinks the water sadly, and leaves in the midst but tin exiguous pool - a perfect circle of intensest blue reflected from the sky, broken perhaps at the very centre by a tuft of rushes that have rooted there and furnish as it were a bull's-eye of darkest green. Next to the lip of the basin the sun-baked floor glares a dead chalky-white, but, growing moister and darker as it approaches the water-line, deepens finally to a muddy chocolate. Darkest green and sapphire blue, chocolate, stark white, and again the dull grey-green of the turf - it suggests nothing so much as some gigantic target of fancy pattern, left there where it fell upon the Down by some archer of prehistoric time. But in the, winter, when the rushes have died down, the basin fills to the brim with water, and there is only splash of colourless water reflecting a colourless sky. In Wiltshire they make such ponds still, and the manner of their making is a " mystery " which rests with one or two families, whose members travel far into the adjoining to make ponds to order. The problem before them is to construct a basin which shall not merely create its own supply - a matter easily achieved - but shall retain it in spite of the porous nature, of the chalk. For this latter object, not in itself easy, the pond-makers would seem to have evolved the most elaborately difficult method conceivable. Selecting their own site-they are jealous of their freedom of choice, and uniformly select the very summit of a rising ground, Where no surface-drainage can be looked for10 - they scoop out a smooth, shallow pan, sometimes as much as 70 yards in diameter, but commonly much smaller. The chalk thus removed is built up all round the pan to form a slight lip, and the basin is next lined with a thick covering of clean, dry straw, extending outwards so as to include the lip. Over the straw is laid a lining of finely puddled clay, carefully disposed so that never a crack or flaw is discoverable ; and over the lip is heaped more chalk, to a depth sufficient to safeguard the clay from damage by treading. The floor of the basin is now carefully strewn with a thin covering of flints, and when the whole is finished a little water is poured in, as it were to give the machine a start. If the work has been properly done, the pond proceeds automatically to fill itself, and continues to maintain itself until, through accident or neglect, the all important clay lining becomes pervious. When this occurs the maker's labour is lost, his pond of no more use than a broken bowl. Therefore great care is taken to prevent heavy animals-horses and cattle-from getting into the pond, and breaking through the lining by their weight. Sheep, being lighter, may come and go with impunity, and it is for the benefit of the sheep that the ponds are mostly built. There are variations of detail in different localities, or according to the traditions of the different members of the " mystery." Occasionally osiers are used in lieu of straw,11 and sometimes other tiers of straw and clay are laid over the first. The Rev. A. C. Smith, speaking from his personal observation of the making of such a pond, says that a layer of clay about 12 inches thick, mixed with lime to stay the earthworms, and covered over with first a coating of straw (to prevent the sun from cracking the clay), and finally with loose rubble, imade up its water-proof bed and lie adds that, to start it in working, " snow was carted in to it at the first opportunity "12 But whatever the variations of detail, the principle is always the same - a lining of elastic clay, and some contrivance to preserve its elasticity. Should this lining become wet though the machine ceases to do it's work. This is why the straw and clay are so carefully carried, well over the lip, so that by no possibility can any overflow from the pond get under the lining; and this also is why the builders choose a site where there is no risk of any surface-water's eating its way into the pan, or of a spring's breaking out within it. Were the clay laid directly upon the chalk floor of the pan, then, no matter how carefully it had been puddled, unless it were of very great thickness it must speedily crack, and therefore fail to hold water. The lining of straw, being elastic, prevents such cracking. The whole is, in fact, an application, upon a magnified scale, of the principle to be seen in a thrush's nest, the lining of which never cracks until the rains of half a year have rendered sodden its foundation of dry twigs and grasses. And exactly as the thrush tempers and toughens her clay with other matter of a vegetable nature, so the pond-makers sometimes mix straw with their clay. The object in both cases is the same --- to secure greater elasticity and toughness. The pond-makers may not always be able to explain why they follow a plan so elaborate and so laborious, but experience has taught them that it is a good one.13 To imagine that their practice is founded upon any knowledge of the relative conductivity of straw and other substances is nonsense,14 as well as needless. In plain matter of fact, their use, of straw is a labour-saving expedient, for without it they must use vastly more clay,15 and that, too, puddled with vastly more care and labour; and even then their labour may prove to be in vain. To assert that primitive man was incapable of such ingenuity would be very rash. He may quite well have learnt the lesson of the thrush's nest ; and after all, the dewpond lined with straw and clay is but a glorified development of his earliest essays in pottery, when lie, wove a basket of osiers or rushes, and lined it with unburnt clay. If the one could hold water, he might reasonably argue that the other would do it also. But, leaving out the question whether lie was not too indolent to construct such reservoirs-and it is diflicult to maintain the charge of indolence against the beings who, with tools so inadequate, constructed a Maiden Castle, or a Stonehenge, or a Devil's Dyke-it is quite certain that he did not exert himself needlessly, and equally certain that he could have obtained the desired result with infinitely less trouble by simply puddling the native chalk. On the South Downs at any rate this used to be the normal plan, and whenever it was decided to make a dewpond of more elaborate kind, it was found necessary to send for the needfull artificers out of Wiltshire, the peasantry of Sussex knowing nothing at all of such complicated contrivances.16 The Sussex plan is merely to scoop a hole of the required size, and thoroughly to puddle the floor of it by assiduous trampling. In this way may be made a pond which will hold all the water It can catch, while it bids defiance alike to the percolation of springs and surface-water, and to the footfall of the heaviest of black Sussex plough-oxen. Indeed the oxen were actually employed to assist in the puddling, for the one drawback of the Sussex pond is that the puddling needs to be repeated at intervals. It used to be customary to set a farm-lad, with the return of spring, to drive the heavy cattle round. and through the pond for a whole day ; or to load up a cart with a ton or so of flints, and drive that similarly over the whole of the basin, so churning up the floor and puddling it to an elasticity which would endure for another twelve months. The plan had the merits of cheapness and simplicity, and further it allowed of the pond's being made in any spot, higher or lower, according to the shepherd's requirements. Even where from neglect a pond had lost its virtue and become dry, it could readily be restored if required. The Downs between Lewes and Arundel are covered with such ponds, mostly abandoned now, although a few are still maintained and used. The process of their gradual undoing may easily be seen and watched. The heat of summer causes the water to shrink, and bakes the exposed portion of the floor until, not having been lately re-puddled it cracks at its driest points, i.e., at the outer edge. When in winter the water gathers again, it refills the pond just, as far as the nearest crack and no further. In the next summer there is left, a smaller supply to withstand the evaporation of the hot months, and yet more of the floor is uncovered, to be cracked as before ; and so the process goes on until, the fissures reaching to the pan's lowest level, it will no longer hold water at all. Meanwhile the turf has been encroaching upon the outer portion of the basin, always pushing forward to the year's high water-mark. In the, upshot the whole of the floor becomes grass-grown and reverts to the turf. One can gauge the relative age of the deserted ponds by the depth of the vegetation and the size of the grassy ant-heaps which dot them over. And yet a very little trampling will suffice to keep the pond in work for unlimited years. To all appearance many of the finest ponds receive little other puddling than that afforded by the feet of the sheep which once a day or so come hither to drink; and considering how laborious a matter it is to cart water from the lowlands to the hills, and to what great distances the flocks must be driven for water in the lowlands, it is astonishing that not only are few such ponds made nowadays, but even the older ones are rarely kept in repair. Of late years it has been the fashion to make ponds with linings of cement, but the method seems to be far from satisfactory, the floor soon splitting and leaving the basin empty. And it is a costly method too. How far back goes the use of artificial dewponds, Whether of the simpler Sussex kind or of the more elaborate type, it is impossible to say. They have no literature apparently until the last century or so,17 albeit of late there has been written more than enough about them. That those who occupied the hill-top forts, of the chalk used such means to obtain and store, water is likely enough to prove that they did so is it more difficult matter, and amongst the cases which have, been advanced in proof some are singularly unfortunate. The square dewpond within Maiden Castle, Dorchester, is not ancient at all. It was constructed as late as 1868, and in the process of making it was brought to light evidence to prove that no pond had ever existed on that spot at an earlier time.18 Outside the northern walls of Cissbury camp,19 Sussex, is a fine pond, and several deeply-worn cattle-ways lead diagonally down the slope towards the pond; but to argue that the pond is old because these tracks lead to it is to assume too much. There is no proof, and possibly no means of proving, that the tracks are old ; and if they be so, their connexion with the pond is, to say the least, doubtful, If one may judge by appearances that pond is of quite recent make, for it shows none of the usual signs of even moderate age; but it is of course possible that an earlier pond may have occupied the same spot.20 As for the trackways, they are so rapidly formed upon chalk slopes that it is impossible to assume them always old. This consideration must rule out the further case of Figsbury Ring (Chlorus camp, Fig. 193), with its alleged ancient cattleways. At Ditching Beacon21 are two ponds abutting upon the north-west corner of the camp. These are undeniably old in a sense, but possibly not much more than a century old, and one of them still holds a little water. It has been suggested that they were designed to be covered by the defences of the camp : it is more in accord with the fact's to argue that the defences of the camp have been demolished in the process of making the ponds. 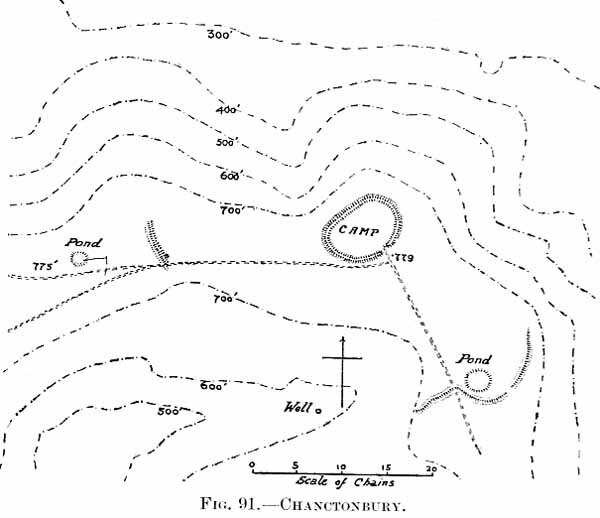 Lastly, there is the case of Chanctonbury (Fig. 91) four miles north of Cissbury. Here, there are two ponds, each some 380 yards from the ring-fort. When Pitt-Rivers, who had always an eye, to the problem of water-supply, examined the ground in 1868-9, the site of one of these was a mound, and the other he does not mention. Yet the latter is so placed as to suggest at once that the outlying vallum and fosse which cover the approach to the camp on this (south-east) side, were expressly deflected to include the pond. The inference from Pitt-Rivers' silence is that forty years ago the pond did not exist.22 As a matter of fact the normal way of embanking the ponds constantly suggests the valla and fosses of ancient fortifications, where there is not the slightest question that the resemblance is entirely fortuitous. The outworks at Chanctonbury followed the natural curve of the hill in the usual fashion of prehistoric engineering, and a pond-maker of the nineteenth century selected this rounded swell of the Down as a desirable spot for his dewpond. By accident he did not interfere with the old trench and vallum. The accident may be accounted fortunate for archaeologists, unfortunate for those who have misinterpreted it as proof of the age of the pond. The writer is not aware of a single case in which the alleged antiquity of such ponds will bear examination; and it is no more permissible to argue the date of the pond from the presence of a camp, than to argue the age of the camp from the presence of the pond. In point of fact the difficulty of the problem of neolithic man's water-supply has perhaps been very much exaggerated, simply because no sufficient allowance has been made for altered conditions. It is not doubted that the Down camps are in some cases, such as Cissbury, of very high antiquity indeed, and if it can be shown that the water question was possibly no difficulty in the case of Cissbury, it will probably be admitted that it was not likely to be a difficulty in other cases. When Cissbury was built the summits of the Downs may or may not have been wooded, but their lower slopes and the Weald below indubitably were densest forest. This means that the climate generally was very moist, and a single waterhole such as that near St. Leonard's, especially if there were a tree or two to help it, would suffice to supply the wants of many persons and much cattle. The fact that through the hottest of summers the turf upon the very crests of the highest Downs rarely goes brown, proves how great a supply of moisture the atmosphere can still furnish, despite deforestation and drainage. It is universally admitted that for centuries the climate and the soil have been growing constantly drier, and in neolithic times the springs without question ran at very much higher levels and in much greater numbers than they do now; so that it is not in the least unlikely that there was a spring either in the valley to the south-east of the camp or in that to the north-east, if not in both. 'But even if there were no spring available, it does not follow that the inhabitants found life very difficult. It is surprising how little drink is really needed even by modern man when he has perforce to stint himself ; probably his neolithic predecessor required still less, not merely for climatic reasons, but also by habit.23 A certain amount could always be, brought up in. skins or jars, and it must be remembered that the warfare of those days knew nothing at all of long sieges. If the human animal could do with little water, still less would suffice for his cattle. Neolithic man would be troubled with no sentimental notions about cruelty to animals, and would certainly not be more tender to his beasts than to himself and his family. The herds could very well wait the short space of a day or two,24 if occasion demanded it, and for the meantime their master had their milk to go on with, While, he is as yet uncorrupted by artificial conditions of life, man, though born lazy, is capable of immense endurance ; and while the modern, who pays rates, grumbles justifiably enough if he but have, to fetch his water from a stand-pipe across the way, primitive man-or more probably primitive woman would think nothing of fetching the requisite supply from a distance of a mile or two, and mostly up-hill to boot.25 Lastly, primitive culture was not measured, as culture now is, by soapsuds and baths. Save what was required for drinking and cooking, little water was wanted at all : for drinking, milk was preferred, and for cooking -- well, if water could not be dispensed with entirely for a day or two without inconvenience, the same liquor would on emergency serve over and over again. Is not the Celtic cook to this day renowned for his (or her) perennial pot-au-feu ? There remain to notice a few isolated cases of constructions which may conceivably have been connected with the, water-problem. In the centre of the hill fort of Cadbury Castle,26 Tiverton, has been discovered and explored a shaft 58 feet deep. Its mouth was a funnel shaped depression with a width of 12 feet at the surface and a depth of 3 feet. The diameter of the shaft was 8 feet at the top, tapering to 3 feet below. At the bottom it was puddled with clay. Nothing of importance was discovered within it, and on the analogy seemingly of the so-called dene-holes and on the authority of a passage in Diodurs Siculus27 it has been declared to have been intended as a store-pit. Inasmuch as ice may be ruled out of the question, it is not obvious what commodity could be held to require so peculiar a store-chamber ; and as the shaft is so narrow that it must have been impossible to get at any but the uppermost part of whatever was kept in the pit, the contrivance hardly tallies with the store-chambers alluded to by Diodorus, from which he expressly says it was customary to take out always the oldest part of the contents. In such a pit as that at Cadbury the oldest part must have been always at the bottom, and quite out of reach. Nor, if it were a store pit, does there seem any need of the funnel-shaped orifice, which is strongly suggestive of a catchment-basin. The puddling with clay may have been advisable even if only grain were kept in the pit, but it was more than advisable, it was necessary, if the shaft, were meant to hold water. In the centre again of the area of the Late-Celtic camp on Mount Caburn,28 Lewes, is a circular funnel-shaped pit with a diameter of 33 feet, carefully banked about. On first seeing this Pitt-Rivers remarked that it " might possibly have served as a reservoir." Subsequent investition discovered that the bottom of the pit was in reality the openi rig of a shaft with a diameter of 12 feet at the, mouth, quickly narrowing to 7½ feet at a depth of 4 feet, and. tapering more gradually to a width of 5½ feet at the bottom, which was 9 feet lower still There was no trace of any clay-puddling, but that this was expressly intended to catch water is proved by the of a shallow gutter or drain, 1 foot wide and 10 inches deep leading to the edge of the pit. In neither case is there anything to suggest that the pit is of different date from the camp in which it stands. Both are furnished with wide mouths which have no apparent use unless it were to catch water. One of the shafts is puddled with clay, obviously to make it impervious, and the other has a gutter which at once betrays its purpose. That no clay is traceable, in the pit, in the Sussex camp is to be explained on the analogy of the dewponds of the neighbouring Downs; clay was not essential, for the chalk could be made, to hold water without it.29 There seems no room for doubt that both pits were designed expressly as water-holes. It does not necessarily follow that either pit was a, success, or so much a success as to lead to the making of such shafts in all contemporary cases. Inasmuch as the activity of a dewpond in collecting water is in direct ratio to the extent of its surface, the Caburn pit was an ingenious compromise between the normal pond and a storage tank, and was a vast economy of space, for to contain an equal amount of water there must have been required at least two ponds of the normal sort, and in a camp so small as this so much space could ill be spared. In the case of the Cadbury pit it would seem that the collecting-pond was unwisely sacrificed to the storage-tank, but possibly the original arrangement of the basin has been lost. It is noteworthy that the entire area of Caburn camp is dotted over with hut-circles. Obviously the occupants kept their cattle elsewhere, if they kept any at all, in the wide trench to the north perhaps, or in separate folds upon the Down without, so that there would be no risk of their getting into the shaft. At Cadbury Castle the huge 50-foot southern fosse might have been designed on purpose for the folding of the cattle. That no similar shafts have been brought to light in other instances is no matter for wonder, seeing how little has been done in the way of systematic exploration of British camps. There is, however, another camp on the South Downs, viz., Edburton Hill, which can show some-thing rather reminiscent of the tank in Mount Caburn. A plan of the camp is given on p. 660. The shallow saucer mound upon the southern enceinte of the fortress has a base-diameter of about 100 feet, but the central depression measures only 33 feet across, or just the same as the pit at Mount Caburn. If this was in truth a waterhole, then its peculiar position must be explained by the dimensions of the camp, which measures barely 150 feet either way, so that there was no room for a pond within the area. 1 Many of the Cornish hill-forts have wells within the area. Streams flow through the small camp on Hawsott Moor (Fig. 34) and the larger Wanlud's Bank, Bedfordshire. Within the lines of the great fortress of Old Oswestry (Fig. 17) is a series of largo pits on the western side. These are commonly supposed to have been intended for the storage of water, and some of them are still wet. Their date is a matter of question, but from their position they would seem to have been planned at the same time its the defences of the camp. 3 Ancient Dorset, p. 49. 4 Within the woods known as the Earldoms, 3 miles east, of Downton, Wilts, but at no great elevation, is a ring-work surrounding a copious spring. 5 Until a few years ago springs used regularly to break out at various points along the 100-feet line under. the Downs overlooking the Ouse Valley near Lewes. Some of these occasionally run still, but many of them have, not flowed for several years. --- another proof of the steady fall of the water-levels. 6 At the present time the wells upon some of the Down farms go down 350 feet and more. At Lee Farm, under Harrow Hill, is, or used to be, a well worked by a tread-wheel, on the principle of the well-known donkey-wheel at Carisbrooke, the farm lads taking the donkey's place, doubtless quite efficiently. There are other such wells at Patcham and at Saddlescombe. 7 See especially Messrs. A. J. and G. Hubbard, Neolithic Dewponds and Cattleways (1905). Twenty- five years earlier a similar view was advanced by Sir George Duckett in Wiltshire Arch. and Nat. Hist. Magazine, vol. xviii. p. 177 (1879), who went so far as to suggest that all the pit's to be seen in the camps of Cissbury and Mt. Caburn were intended to hold water, and even thought that, the ditches of British camps on the chalk might have been puddled to serve as reservoirs ! Another writer (Mr. T. Shore) has advocated the pond-theory for the Hampshire camps, but, without offering any proof of the antiquity of the ponds now found in many of those camps. 8 In some localities they are known indifferently as dewponds or fog-ponds. It has been suggested that the former name is not old, but it is certainly a great deal older than the discussions which have of late popularized it. Old natives of Hampstead still allude to the ponds on the Heath as the "fog-ponds," and the writer ling known a man who constantly spoke of a certain pond upon the Chilterns as the " dewpond " ; and his memory would go back fully 70 years from now. 9 This particular pond has been known as " the Dewpond " for at least three-quarters of a century - sufficient answer to those who question whether the term was over heard upon the Chiltern Hills until to-day. 10 The following is quoted from an anonymous leaflet dealing with the Dew- ponds of the South Downs :--" They are frequently found at the heads of gullies running up the southern or seaward slopes of the hills ; often indeed with their rims built up like the - edge of a eup or saucer projecting into the head of the gully. Up the gullies come the mists, and as they reach the top they meet the Cold air coming from the north and drop in a perpetual rain of condensation into the basin or pond put ready to receive them." The ponds at Chanctonbury (Fig. 91) are a good instance of what; is meant. The cloud-cap which seems to hang motionless about a mountain-top, is merely a constantly moving current of air, made momentarily visible at that one point by condensation. So vigorous is this condensation that this alone, and no visible springs, suffices to maintain the supply of considerable rivers and to keep large areas of upland moor in the condition of bog thoughout the year. But, on the chalk there are no bogs because that porous material can carry off any quantity of water. 11 This is said to be the practice, e.g. in Norfolk. 12 British and Roman Antiquities in N. Wilts (1884). It must bc owned that his account is hardly convincing. He seems to reverse the arrangement of clay and straw ; and it is not, easy to see why straw was needed at all in his method. Neither does it appear a practical method, which compelled the pond-maker to wait for a sufficient snow-fall to start his pond. And, if there was snow enough to cart, how was it that it did not, fall into the pond and so save the trouble of carting? Mr. Smith mentions A Practical Treatise on Dewponds, by H. P. Slade. 13 It has been found by actual experiment that a dewpond may rise as much its 2 inches in a single foggy night of January, and in five nights. rise fully 8 inches. In the early summer the same pond collected 3½ inches of water upon five nights of heavy dew. 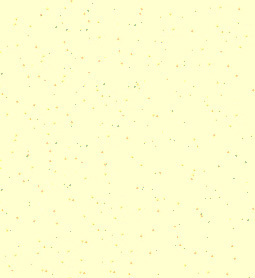 Fog, therefore, would seem to be a more copious source of supply than mere dew. Of course the ponds catch whatever rain happens to fall into them, but it is a phenomenal rainfall which amounts to a single inch in 24 hours, to say nothing of twice that quantity in half the time, The shepherds of the Downs will tell one that it, frequently rains copiously on the hill-tops when no rain at all falIs in the valleys. 14 It has been thought that straw, etc., were used because these in some way aided the precipitation of dew, the work of condensation. But the determining fact is, of course, the temperature of the water, and the presence or absence of a straw lining some inches below the surface of the basin call have no appreciable effect upon the water. 15 The clay, it is to be recollected, will usually have to be fetched from a considerable distance ; and to drag up to the top of a 700-feet Down, and properly to puddle, clay sufficient to line a 50-feet pond is a matter of very great labour ; while the task of spreading it uniformly without flaw is one requiring very great skill, experience, and patience. 16 " The Pond-makers' Arms" is the name of a Sussex inn. Does this refer to some bygone importation of droughty moonrakers, or rather to the equally thirsty iron-smiths and hammer-ponds of a vanished generation ? 17 Letter XXIX. of White's Selborne (under date 1776), has something to say about dewponds in Hampshire, and especially about the capacity of trees to act as rainmakers. The Wiltshire-born Richard Jefferies also has something to say of them (Wild Life in a Southern County, &c.). Both these are worth reading because they both wrote of facts which they had observed. A good deal of what has been written since Jefferies' time is neither fact nor observation. 18 See above, p. 100. 19 A pIan and description of this camp will be found below, p. 647. 20 It is referred to, apparently, by Sir G. Duckett, (Wilts Mag., xviii, p. 179) as existing, in 1879. This is not a dewpond at all, but, an ordinary catchment-basin fed by surface-water, and the two trackways under discussion are themselves it's best feeders. In hot summers this pond runs dry. 21 For plan and description see below, p. 668. 22 The argumentum ex silentio is legitimate here, because Pitt-Rivers was actually looking for the water-supply. All that he could discover was, a well, which he believed to be Roman, in the " bottom " to the south of the camp, and a spring below the northern face of the Downs. To anyone not acquainted with the mental capacity of the Southdown shepherds, it might seem an easy matter to learn from them at what date such a pond as this, or that at Cissbury, was constructed if they are indeed modern. It, is not easy, for the same man will tell you, almost in tile same breath, that one and the same pond was made 'a bit since, " and that it has "always been here." The only determinable truth that the writer has been able to arrive at from their evidence is that many of the big ponds in this neighbourhood (those at Chanctonbury included) have been made within the last 40 years, and some of them according to Wiltshire methods. 23 Thirst, is largely dependant upon the kind of food eaten, and the food of neolithic man was very diferent from that of his later day representatives. 24 A sheep may be penned p without water for an entire fortnight in the intense dry heat of an Australian hot season, yet will not emerge visibly any the worse. Oxen have less powers of endurance, but they do not require anything like the amount, of water one Would suppose. Very possibly they could get moisture enough from the dewfall of a summer's night, on the Downs to keep them going all day. This at least, is the Conviction of Wiltshire folk. 25 This is still the habit amongst African savages, who fetch and store their water in calabashes. 26 See the plan on P. 111. 27 See the preceding chapter, p. 249. 28 See the description and plan, p. 677. 29 It may be remarked here that although chalk is usually porous, it is a very variable stone, and there are cases in which its texture is so firm and fine as to be impermeable. Pitt-Rivers explored the camp. He showed the pits to be the sites of wattled huts, the larger hollow to be a catchment, basin provided, with a drain to feed it ; and he established the date of the entire tramp as Late-Celtic. Of the once fine camp on Ranscombe Hill, only 500 yards away from the western gate of Mt. Caburn camp, there remains nothing but a fragment of the eastern defences. These once consisted of a fine vallimi, ditched where the ground called for it, but elsewhere scarped only. They have Been all but obliterated by constant ploughing, though what profit can be had of a soil so utterly stony as is the area it is not easy to see. Not even in Cissbury itself is the litter of flint-flakes and a chips more extensive than here. Excavation has proved this to be the site of a camp of much greater age than Mount Caburn, but apparently re-occupied during the Roman period. Upon the hillsides about are traces of lynchets, and in the cupshaped valley called Bible Bottom to the north is a series of rectangular enclosures, faintly traceable still when the light serves, which are supposed to mark ploughlands of great antiquity. 2 It is figured and described in the Antiquary, January, 1907.